Feedback from one of our latest team members - who chose to become part of The V.I.P. F&HM Team. Do you feel that we could improve on our training process and if so please elaborate where and how? “The training process from a road map perspective is well planned and executed – as long as you do it! The business theory and set up being the first couple of elements is a great way to get your head space sorted. 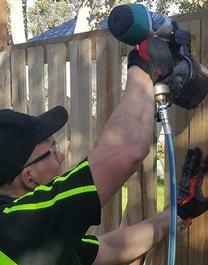 The physical construction side of the training is well planned with a variety of jobs being available to ensure that you get to see and more importantly do constructions of these different fences so that you hit the ground running. Having been through various training programs in the past, I believe V.I.P. have got it pretty damn close to being spot on. Overall from your initial inquiry, through to signing your contract, was there any part of the process you felt could have been done better and if so elaborate? Responsiveness – all enquires, and questions were answered in a very timely manner. Professionalism – no bagging of other franchises and seeking to understand why I want to do this and not just simply sign me up for $. Attitude – a positive attitude. Level of detail on the business – the right amount at the right stages to ensure that we were informed.